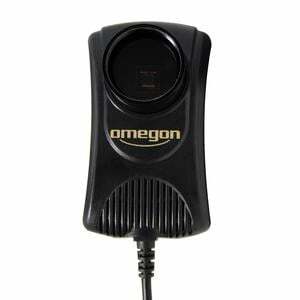 The Omegon Webcam offers you a simple way of taking photos of the planets and the moon. Even if you have no previous experience in astrophotography, after one night you will already be able to show off beautiful photographs of the planets. Saturn with its rings or Jupiter with its moon system will, in future, no longer be just fleeting impressions. Hold on tight to the Omegon CCD Webcam! Webcams offer interesting options for planet photography. Unfortunately, not every webcam is suited to astro-imaging. 99.9% of all Webcams on the market have the unsuitable CMOS type chip. A proper CCD chip is indispensible for astrophotography. A CCD chip is more sensitive and has considerably less noise than a CMOS chip from a comparable webcam. Philips webcams set the standard for many years, but these webcams are not longer produced. Omegon has reacted to this by putting its own planetary camera on the market, in which once again the proven CCD chip is built in. The Omegon CCD Solar System Imager is certainly one of the most inexpensive ways of taking high-quality photographs of the moon and planets. There are even some improvements on the old Philips webcams. These include a new built-in video controller that makes possible download rates of up to 30fps via USB 2.0. The camera can deliver up to 30 images if a sufficiently fast computer is attached. You can then produce really excellent photographs of the planets by using the Giotto or Registax freeware programs. Nearly all committed planet and moon photographers have such a webcam in their arsenal. Setting up the webcam is very simple. It is connected by means of a USB interface. The low weight of the camera is no problem for even for the most basic of telescope mounts. 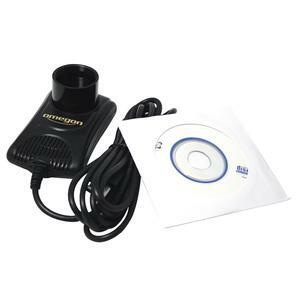 Delivery includes a 1.25” telescope adapter so that you can connect the camera directly to the telescope in place of an eyepiece. The planets will still appear too small when you attach the camera to the telescope. We would therefore recommend using a Barlow lens with every webcam. This increases the focal length and displays the planet as a larger image. 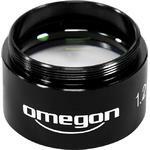 We would additionally recommend using an Omegon infrared filter, which you can purchase along with the camera. 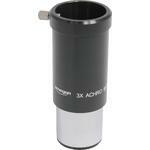 You can now use your new Omegon CCD Solar System Imager optimally with the Omegon software CD included. Simply put the CD into your CD drive and the user-friendly interface will start up automatically. You can select the language required from German, English, French or Polish. You are also provided with a selection of different drivers and software for Windows XP, Windows Vista and Windows 7 (64 bit). Note: At present, the camera is not able to work with Apple computers. The chip makes the difference. Webcams are an interesting option for planetary photography. Unfortunately, not every webcam is fit for this purpose. 99.9% of all webcams on the market have an unsuitable CMOS chip. Astrophotography requires a proper CCD chip. CCD chips are more sensitive and produce much less noise than CMOS chips from comparable webcams. Philips webcams set the standard for many years, but these webcams are no longer produced. In response, Omegon has brought its own planetary camera - using the proven CCD chip - onto the market. 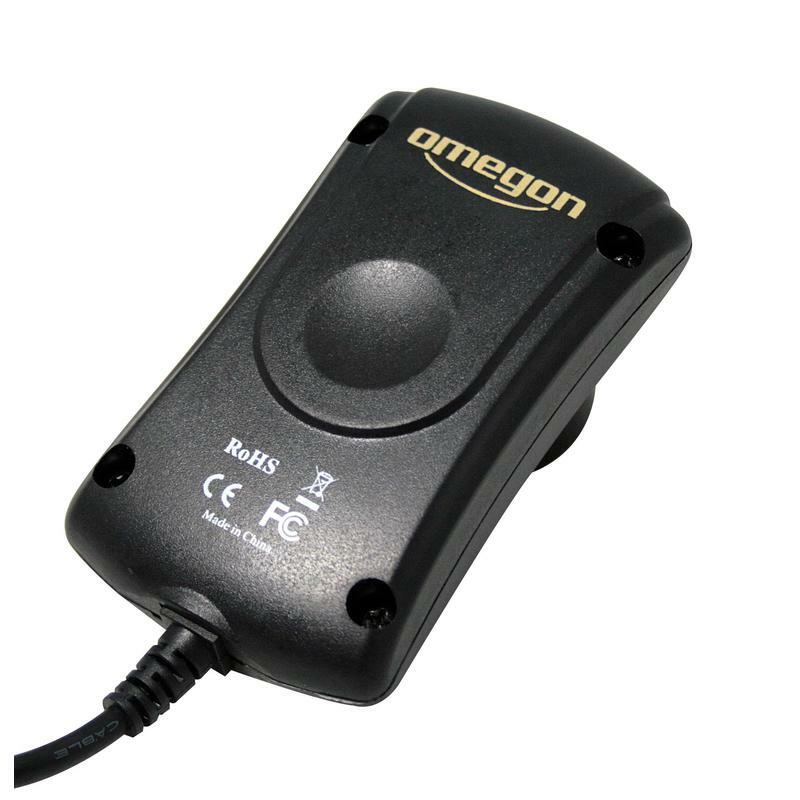 The Omegon CCD Solar System Imager is certainly one of the most inexpensive ways of carrying out high-quality lunar and planetary astrophotography. There have even been some improvements made on the old Philips webcams. These include the installation of a new video controller that allows downloading at up to 30fps via USB 2.0. The camera can hence deliver up to 30 images per second if a sufficiently fast computer is connected. You can produce truly excellent planetary images using the freeware programs Giotto or RegiStax. Almost everyone involved planetary and lunar photography will want to own such a Webcam. Setting up the webcam is easy. Connection is made via a USB interface. The low weight of the camera means even basic mounts will not be overloaded. 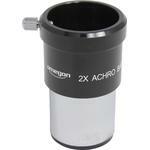 A 1.25 inch telescope adapter is included so that you can connect the camera directly to the telescope, in place of an eyepiece. When the camera is first connected to the telescope, the planets will appear too small. We would therefore recommend using a Barlow in conjunction with any webcam. 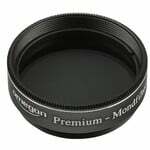 This increases the focal length and hence the planetary images become much larger. 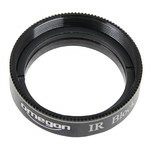 We would also recommend using an Omegon infrared cut-out filter - this can be purchased along with the camera as a set. Your can make optimal use of your new Omegon CCD Solar System Imager using the Omegon software CD supplied. Simply insert the CD in your CD drive and a user-friendly interface will automatically start up. You can then select between German, English, French and Polish. There is also a range of different drivers and software - for Windows 7/8/10 64-Bit). Note: The camera does not yet function with Apple computers. Device USB \ VID_0547 & PID_7303 \ 5 & 1d4a5fab & 0 & 2 could not be migrated. Is there a solution or other compatible driver?